Just across the impasse from the Delirium Cafe, next to the statue of Jeanneke Pis, the Delirium Cafe has opened an absinthe bar. They're trying to do for absinthe what they did for beer in terms of stocking and consumption. Below you see a tall shot glass of absinthe with a layer of sugar in the bottom. Sugar? See the following explanation. What I knew of absinthe was limited to its tradition. La fée verte. The ritualized preparation with the slotted spoon, drizzled water, and sugar cube. The louche or milky clouding of the resulting liquid. Things are different now, at least in bars catering to foreign visitors looking to get hammered. First you choose from a bewildering variety. Notice the thick menu with the pink binder. 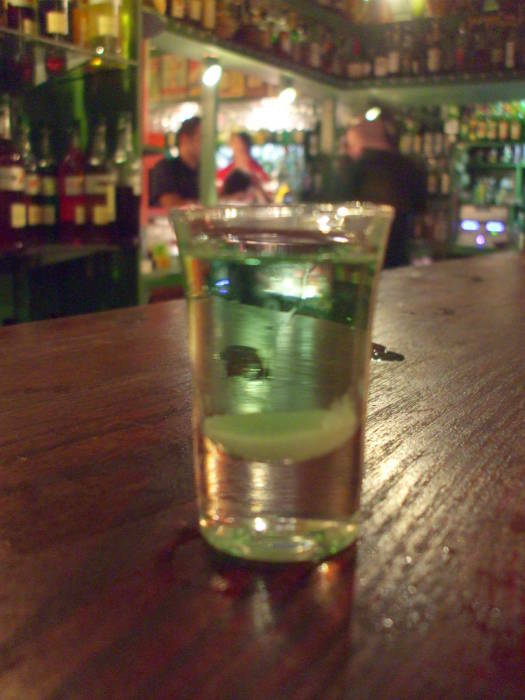 The absinthe is poured into a tall shot glass. 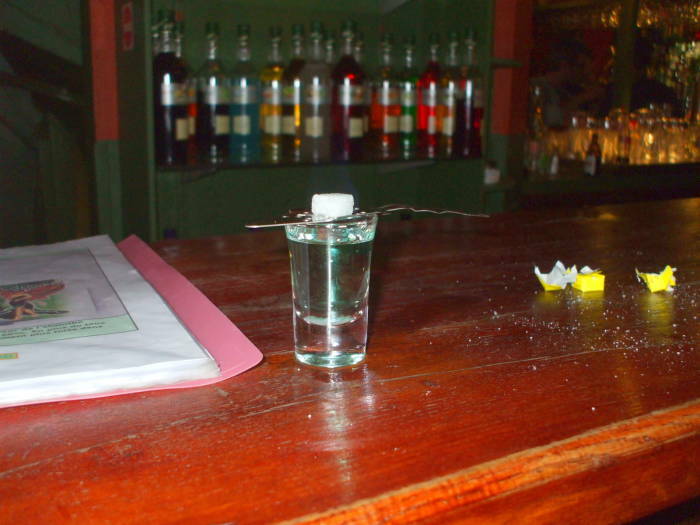 A slotted spoon is used to dunk a sugar cube into the absinthe and then suspend it above the glass. The sugar cube is then lit on fire. It's burning here, but the pale blue alcohol flame is almost invisible with the camera flash. The plan is to ignite the absinthe-soaked cube, let it burn briefly, then drop the cube into the glass. Absinthe-soaked sugar cubes are flammable, but dropping the burning cube into the glass of absinthe extinguishes the flame. Below is a shot in which the flame is more visible, although the lack of flash makes for a rather blurry picture. 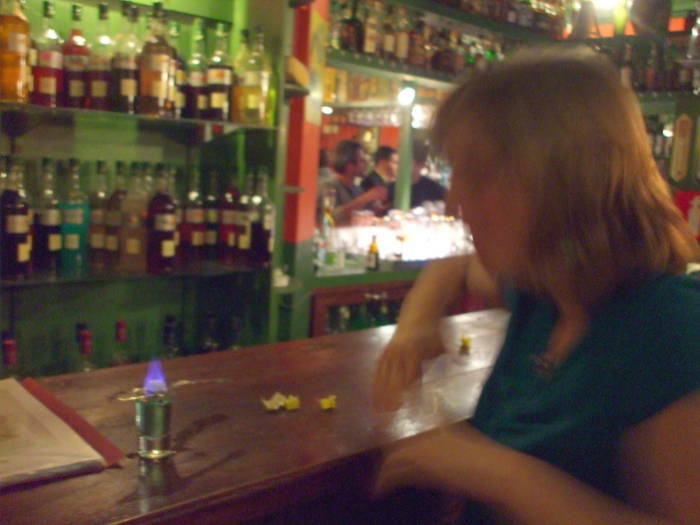 My assistant, one of a group of vacationing French midwives (and there's an infrequently used phrase) is urging me to quickly extinguish the flame by dropping the sugar cube into the glass, "before all the alcohol burns off." Since it's just the sugar cube that's burning, the only ethanol you're going to lose is what is permeating the sugar cube. But here I am trying to be scientific in an absinthe bar. That's probably not a very useful plan. As you can see here and in the pictures at the top of the page, the sugar doesn't really dissolve in the absinthe. We could drift into a futilely scientific digression on the relative solubilities of sucrose in water versus ethanol, but once again, an absinthe bar probably isn't the best venue for science. The sugar provides a gritty sweetness to offset the overpowering sensations of anise and alcohol. Let's leave it at that. 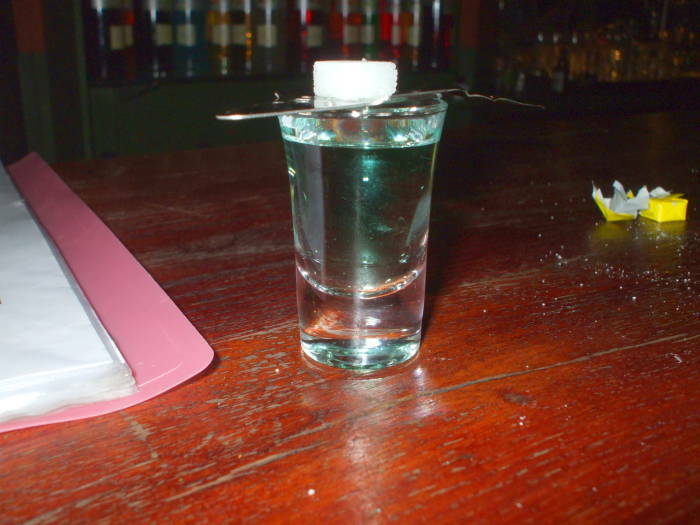 This fire-based preparation is called "The Bohemian Method" as it comes from the Czech Republic, where absinthe production continued during bans in western Europe and the U.S. I learned of the Czech terminology after visiting the absinthe bar. The Czech origin makes sense to me. Having been to Russia and Estonia a number of times, I thought that the absinthe bar had a very Far Eastern European atmosphere. Part of this was due to the groups of young guys in black leather jackets and Russian Prison Haircuts shouting in various Slavic languages between downing shots of absinthe. Well, some of them were shouting. One was unconscious, bent forward with his forehead on the table. Another seemed to be unconscious as he was lying motionless on the floor under their table. Absinthe was developed in Neuchâtel, Switzerland, in the late 1700s. It's a distilled spirit flavored with botanicals including the flowers and leaves of wormwood, Artemisia absinthium, along with anise, fennel, and other herbs. Drinks with wormwood date back at least to the time of the Roman philosopher Lucretius (about 99–55 BC), who mentioned it in his epic poem De Rerum Natura. He said that a drink containing wormwood was served in a cup with honey on the brim as a medicine for children. Medicinal wormwood extracts had been used since about 1550 BC in Egypt. Absinthe was given to French troops in the 1840s as a malaria preventative, and they returned home with a taste for absinthe. It became very popular in France in the late 1800s and early 1900s, especially among artists and writers. The hour of 5 PM in France became l'heure verte, the Green Hour. Mass production greatly lowered the price, making absinthe accessible to everyone. 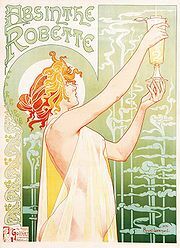 The French were drinking 36 million liters of absinthe a year by 1910, versus almost 5,000 million liters of wine. Absinthe's association with the bohemian society led to social conservatives working for its prohibition. Wild claims were made about it causing insanity and epilepsy, and somehow leading to tuberculosis. In 1905 a Swiss farmer named Jean Lanfray was reported to have drunk absinthe and then murdered his family and attempted suicide in a drunken rage. The crusaders overlooked the fact that he had first had seven glasses of wine, six glasses of cognac, one coffee with brandy, and two crème de menthes (plus a sandwich) before the absinthe. This led to public panic in Switzerland. By mid 1908 the production and possession of absinthe was illegal in Switzerland. It was banned in France in 1914. 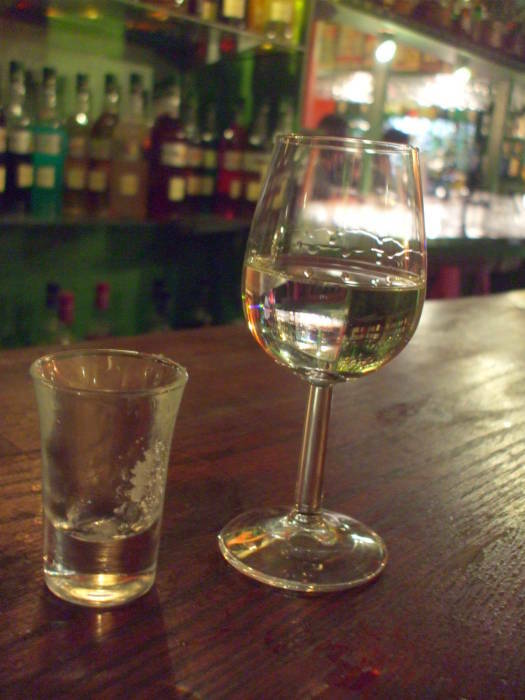 The UK never banned absinthe, and started importing Czech absinthe in the 1990s. In 2000 La Fée Absinthe started the first production in France since the 1914 ban. The Netherlands, Belgium, and Switzerland ended their bans in 2004 and 2005. In 2007, absinthe began to be legally imported into the U.S. since its 1912 ban. The result of all this is that most countries have no legal definition of absinthe, meaning that it's pretty much whatever the manufacturer decides to make and label as such. It's a perinneal plant often grown as an ornamental. It came to be called wormwode or wermode in Middle English, modernizing to wormwood, because it was used as a vermifuge or anthelmintic, a drug that expels worms and other internal parasites. It came to be used to spice wine, mead, and tea through the Middle Ages. Wormwood extracts contain some small amounts of thujone, which has been blamed for absinthe's alleged psychoactive and even hallucenogenic properties. Its molecular shape led to theories that it would have effects similar to those of THC. But recent studies have shown that traditional absinthe contained only very small amounts of thujone. 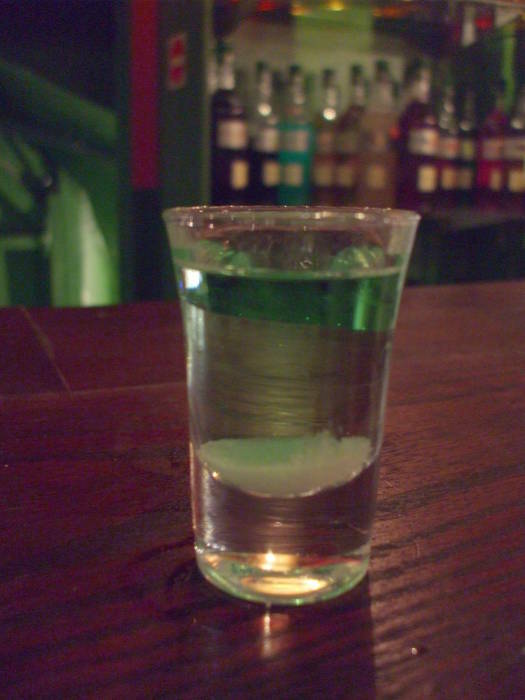 A 2008 study of pre-ban absinthe showed that they contained about 25 mg/L on average, less than one-tenth what was previously believed. And on top of that, thujone's effects have been found to have little in common with THC. Current EU regulations on thujone levels limit it to 0.5 mg/kg in food, and up to 35 mg/kg in alcoholic beverages prepared with Artemisia absinthium. The regulation in the US is that absinthe must be "thujone-free", which is interpreted as less than 10 mg/L. Regulations in Canada vary by province, from 6–8 mg/L in Manitoba to 15 mg/kg in Quebec.